Wait for the volcano to erupt on your slot grid and let the cash prizes flow in! Volcano Eruption slots is a legit slot game that’s beaming with rewards. 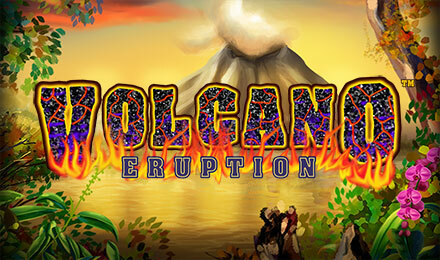 Volcano Eruption is a NextGen Gaming slot game set in the middle of the South Pacific forest. Playable from 25p to £50 per spin, the exciting slot game features symbols like parrots, monkeys, iguanas and volcanos. The volcano is the wild symbol that appears only on reels 2, 3 and 4 that replaces symbols to complete winning combinations. The Eruption Feature will award you with 5 respins when triggered where the volcano will erupt on the middle reel and make it an expanding wild. Lava bombs will land on the slot grid and turn into random wilds, increasing your winning streak.